Editor’s note: This image and post are part of an occasional series of photo essays The BoP Project is making available to NextBillion readers. All images by Jonathan Kalan). If you happen to come across Angelina Mwenzi while navigating your way through the tightly packed, and often slippery, footpaths of Silanga Village in the Kibera slums of Nairobi, you will undoubtedly conjure up one word: potential. Angelina embodies the spirit, attitude and ambitions of a class of BoP entrepreneurs that social enterprises are scrambling to unlock. A woman who has been dealt the bottom of the deck, she capitalizes on every opportunity to improve, not only her own situation, but also the situation of her community. Silanga, home to roughly 20,000 people, is not necessarily one of the roughest places in Kibera – it lies in the southeast corner of the dense urban slum, tucked on the edge of the Nairobi Reservoir. To one side, a tiny playground, community gardens, and a vast green marshland, which allows a slight breeze to slip between the thicket of poorly constructed sheet metal and mud brick dwellings. To the other, a vast expanse of poverty, untapped economic potential, and haphazard development attempts. Yet calling Silanga one of the “better” places of Kibera is somewhat akin to saying calling a prison “good.” It’s still a prison. And Kibera, Africa’s second largest slum with a population estimated between 150,000 to 1 million, lacking even the most crude signs of acceptable infrastructure such as running water, power, and basic sanitation, offers its inhabitants limited means of escape. 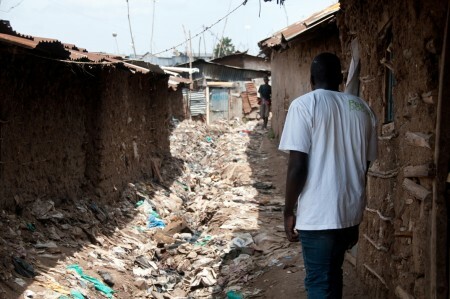 (Above, a walk through Silanga Villiage, in the Nairobi slum of Kibera). Despite raising five children, four grandchildren, and now accommodating up to six people in one small bedroom, Angela fills as many hats as her head can hold to make ends meet and improve her community. 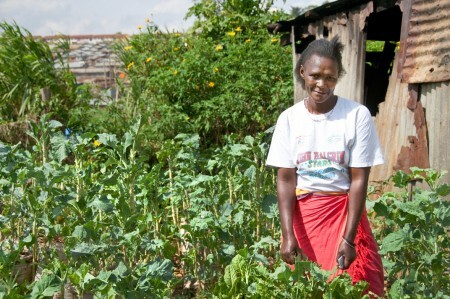 Among her several positions in community committees and local NGO projects, she actively serves as a Community Health Promoter, is a member of the Riverside Silanga Garbage Collection group, tends to a small garden on the fringe of the village, sells bags of charcoal on the street to make a small income. And, since the end of last year, she earns 50-60 Kenyans shillings per day performing a task few would care to discuss let alone do: collecting poo. That’s right. Feces. Little, specially treated, white and green bags of human excreta, to be exact. Angelina is one of a few locals empowered by Peepoople AB, a Swedish social enterprise that launched a pilot project in Silanga in October. She’s built her own small business out of The Peepoo, a personal, single use toilet that turns human waste into fertilizer. The device sanitizes human excreta shortly after defecation, preventing the feces from contaminating the surrounding environment. After just a few weeks, the bags convert the waste into a nutrient rich fertilizer. 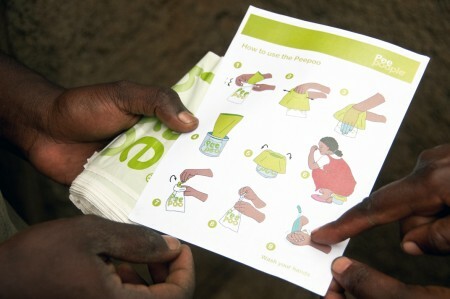 The Peepoo bags, which sell at a subsidized (by Peepoople) cost of 3 Kenyan Shillings each, are used at home, then returned to one of two “drop off” points where customers get a 1 Ksh refund for returning the bags. (A brochure explaing how to use Peepoo and santize hands afterward). It’s in this simple, 1 Ksh refund, that Angelina saw an opportunity to develop a little venture for herself. Some residents either feel uncomfortable, or don’t have the time, to drop off the bags, which are designed to both eliminate odors and ensure the safety of the handler. Angelina collects bags from her neighbors, and returns them in bulk, pocketing the 1 Ksh refund. On a good day, Angelina told me, she’ll collect and return 60-70 bags during her morning rounds (people leave them outside their houses for collection), making close to $0.85 for an hour’s work. While some may protest the idea of using nothing more than a chemically treated doggy bag as a “sanitation solution,” first, consider the alternatives. A “flying toilet,” which is common in places such as Kibera, is nothing more than a small grocery bag used as a toilet and thrown out of a residence onto the street. Other options? Communal pit latrines, which are filthy, lack privacy, overflow during rains, and typically harbor more diseases than anyone would be comfortable measuring. Then, speak to Peepoople co-founder Camilla Wirseen, who will list the World Health Organization’s guiding principles for “sanitation,” and point out that, in fact, The Peepoo is one of the few solutions that actually meets all of the requirements, even though it may seem counterintuitive. With no running water and little space to build proper toilets, The Peepoo is certainly an innovative personal option. Finally, ask Angelina. She’s capitalizing on other’s unwillingness or inability to return the bags, and in doing so easing the barriers to adoption of this pilot program in her community. If Peepoople continues to grow, and adoption of Peepoo bags in Silanga increases, Angelina can continue her small scheme and earn a bit more money. If the organization stalls, or fails for some reason, she’ll be right back where she started, perhaps with a few more Shillings saved under the mattress. No matter what, Angelina is the kind of woman who will keep looking out for that next opportunity. Now, a considerably important question for the BoP development community remains. Is she simply entrepreneurial to survive, or the kind of entrepreneur who’s ready to build a thriving business?